This homebuilt aircraft throttle quadrant contruction advice is based on my customized quadrant for a Vans RV-8. However, builders of any kitplane will find ideas here that apply to them. 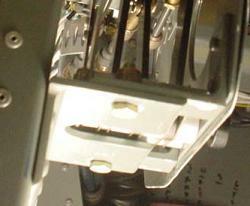 I have short arms, and found the standard location of the aircraft throttle was too far forward and outboard. It was too uncomfortable for me to reach, so I felt like I was stretching to get to it. Since it’s my plane, it should fit me. I teamed with a friend of mine who also suffers from the same affliction, and we came up with our own throttle quadrant that moved the throttle inboard and aft just enough to make it comfortable. We started with the F-864BPP Throttle Quadrant Cover as a template for our cover. Using posterboard, we marked the F-864BPP, then added the extra thickness for the F-804 channel. We left it long enough in the front to play with. We then put it into the cockpit and messed with the front until we were happy with the look as it mated to the bottom of the F-803BPP-L Instrument Sub Panel. This gave us the angle for the front of the cover. To make the side, we traced the F-864 onto posterboard. 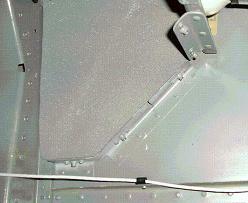 The top was cut to shape to match the cover, and the bottom was cut to fit over the F-806A-L forward arm rest. The slant was cut to a pleasing thickness, lightening holes drilled, and the bottom turned in to provide rigidity. 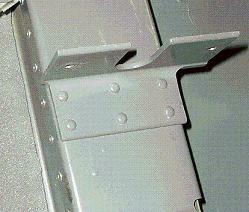 The cover is held to the side by an aluminum angle flush riveted to the back sides of both. 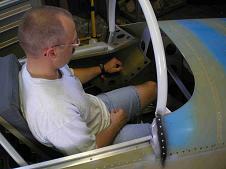 We then cut the F-864 to fit on the inside of the new cover and provide extra support to the throttle assembly. We did have to install longer screws into the four corners of the throttle assembly since they were now going through the new cover and what was left of the F-864. We used AA3-032 ¾ x ¾ to secure the outside to the skin above the F-864C. 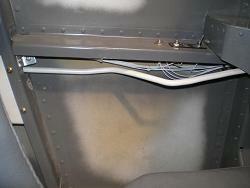 More of the same AA was used to secure the front to the bottom of the F-803BPP-L Instrument Sub Panel, and the back to the F-806A-L Forward Arm Rest. 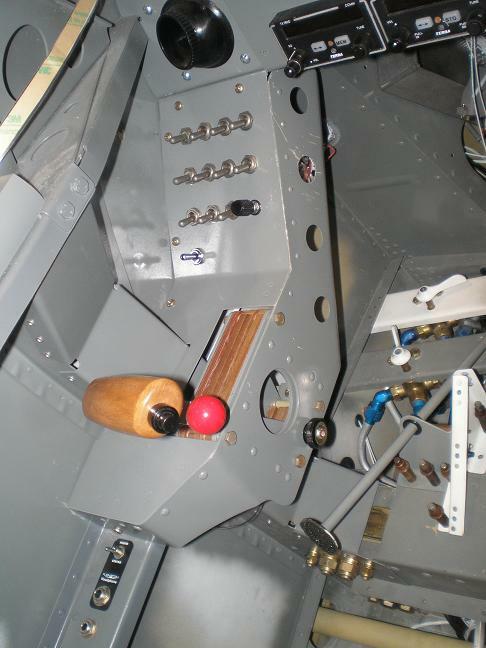 We riveted all of the AA in place, and installed nutplates to hold the aircraft throttle quadrant. To support the bulk of the weight, we used some 2 x 2 ½ x 3/16 6061-T6 leftover from the T-405 tank attachment angle. My friend riveted his to the F-804PP-L, and I bolted mine. Two pieces of 3/16 aluminum angle are riveted to the side of the throttle quadrant to match up to the top of the 6061-T6 bracket. 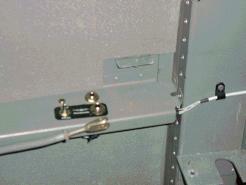 Two bolts secure the throttle quadrant to the bracket. Because I had moved the front throttle, the linkage to the rear seat needed modifying too. I started by drilling the holes in the F-805-L bulkhead as depicted in Template #1 provided with the Rear Seat Throttle Kit. I bent a piece of scrap ¼ inch tubing to get the rough shape I wanted. 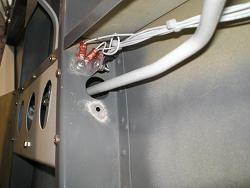 I used this piece of tubing to enlarge the hole as needed until it could travel freely without scraping. It took a lot of cycles of bend a little, enlarge the hole, bend a little more until I got the hole large enough, and the tubing bent correctly. I was finally happy with the look and fit, so I made the F-8114B pushrod by copying the tubing with the correct 5/16 O.D. 6061-T6 tube. Then I threaded the ends and installed the AN316-4R Jam-nuts, the MS21252-4RS Clevis, and the M34-14 Rod end bearing as depicted in drawing OP-2. When I first hooked it all up, the MS212532-4RS Clevis was bottoming out on the front throttle lever before the lever was in the idle position. It took a little extra bend to get it to fit without interference. It’s hard to tell from the pictures, but the pushrod stays pretty tight to the fuselage skin until just aft of the F-804 channel, then it turns inboard and up into the front throttle lever.